Kaiser Family Foundation released their most recent media usage study. Six years ago they found the usage of 8 to 18 year old was about 6 hours and 21 minutes of media consumption a day. This recent study shows that the media consumption rate has risen to 7 hours and 38 minutes. That is almost as much time as adults spend at work except remember that adults only work 5 days a week. The amount of media consumed by children has always been a point of concern as media has been found to have great affects in molding a child’s view of the world. It has become all the more important that parents watch over what their children are consuming and what kind of message they are taking in. Some things parents can do are to regulate what kind and what type of media their children consume. Another is to watch what your kids are watching together so you can explain how best to process the message it portrays. Another is to ensure internet safety for kids with tools that can supervise online activities. With the proliferation of online media, increased video sharing, and mobile media – these numbers are shocking, yet they are not a surprise. For the first time, Traditional TV consumption actually fell as other mediums such as video games, music, online media and movie watching has increased. What is even more wild is that kids are often watching multiple forms of media at once. The actual consumption of media was found to be closer to 10 hours and 45 minutes. Greater adoption of iPods and other MP3 devices has increased access and usage of mobile media. Children are able to surf the internet while listening to music and perhaps watching TV all in the same time. In 2004, only 39% of 8 to 18 year olds owned a cell phone. Now it is closer to 66%. Ipods? Jumped from 18% to 76%. TV broadcast consumption fell from 3:04 to 2:39. However TV consumption as a whole has increased by 38 minutes. This increase can be partially attributed to mobile media as kids watch movies and videos on their cell phones, but also a continuous trend towards TV show streams being available online. 71% of all 8 to 18 year olds have their own TV in their rooms. An Average home with an 8 to 18 year old contains 3.8 TVs, 2.8 DVD/VCR players, 1 digital video recorder, 2.2 CD players, 2.5 radios, 2 computers, and 2.3 console video game players. 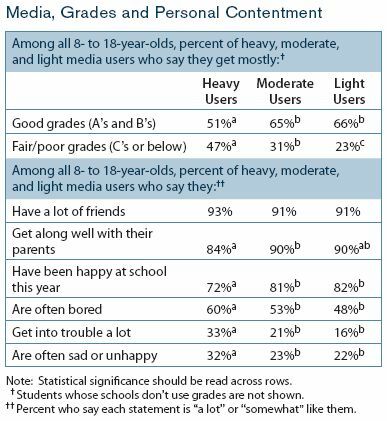 Nearly half of all heavy users who consume more than 16 hours of media per day (21% of all 8 to 18 year olds) report having fair or poor grades compared to 23% of light users who show less than three hours of consumption. Unfortunately statistics still support that majority of parents do not engage in much regulation of media consumption. This report was based on a national survey of 2,002 3rd to 12th grade students and includes a subsample of 702 respondents who volunteered to complete seven-day media use diaries. This is the third of such reports by Kaiser Family Foundation. It is a pretty long study with lot of great media consumption statistics to consume. We’ll try to break it down for you hear at Clean Cut Media with future posts. So be sure to come back! What are your first thoughts about these statistics? Parents, how does your kids compare? Do you have rules or limits? Have they worked? The facts are unsettling but not surprising. Adolescents are being introduced to technology at a much younger age and it is becoming a normal part of their everyday lives. The problem isn’t access to new technology, it is that it goes unchecked. The amount of time kids interacting with media isn’t supervised or limited, a problem when there is so much questionable material out there. Not to mention things like surfing the web and streaming TV shows is so isolating. Virtual interactions are no substitute for interactions in reality. Appreciate the comments! Glad it could be of help. The more others know about these statistics, the better it will be. Can I please have Author’s name to this article? I would like to cite the statistic on my research paper please and thank you. no problem tokmagic. send you an email. also you can use the search function on the top of the page to look for related articles. I would like to cite your article, but I have a few questions. Where did you get your statistics? Who is the author of this article? Hi there, can I get the name of the author as well. And can you tell me what country these statistics are referring to. UK, US or international etc. Is there any studies done on adults and their media consumption? This is great but I would like to know ho adults compare due to all these new technologies. I would like to know the citing information for this article for my research paper please! Thank you. thanks for visiting. come again! awesome…yet sad… I will also like the authors info please.